Rat Schwann Cells (RSC) are the principle glial cells in the peripheral nervous system, providing physical and chemical supports for neurons. Myelinating Schwann cells surround neuronal cell bodies (sensory ganglia) and fibers (sensory and motor neurons) to form an insulating sheath. Periodic exposure of the axonal membrane to the extracellular space at the nodes of Raniver (myelin sheath gaps) allows rapid propagation of action potentials along the axon. RSC are important for morphology, survival and growth of axons & neurons. Studies also indicate Schwann cells promote neuronal restoration and experimental spinal cord regeneration. The calcium binding protein S100β, a marker present in cultured Schwann cells, participates in paracrine mechanisms and neuronal maintenance. S100β exerts neurotrophic effects to both peripheral sensory and motor neurons, and demonstrates experimental promise to repair, restore or treat nerve injuries and CNS lesions. 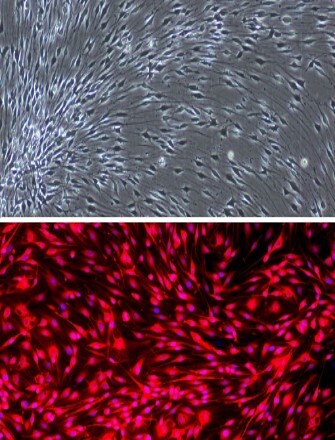 Characterization: Rat Schwann Cells from every lot stain Positive for S100β, attach & spread on tissue culture ware and proliferate in Rat Schwann Cell Growth Medium.